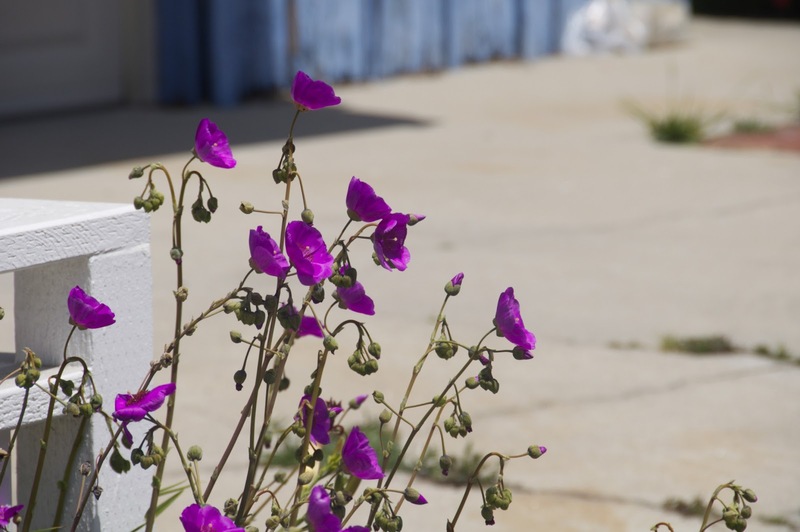 summer's in the air and it feels like magic. the air feels lighter, and the nights feel warmer, even when they aren't. the twinkling lights that hang from the umbrella on the deck are sparkling in full force. sitting under them with a blanket is a happy place. i am not tan. but my hopes and dreams of golden skin are at an all-time high. i want to drink cucumber water and tequila and things that are limey. i also plan to buy sidewalk chalk. and put my feet into many sandals, only to kick them off later. and ah, this breeze. this summer breeze is blowing on my face and i'm trying my best to stop and feel it. it's all about what we can make of our days, isn't it? 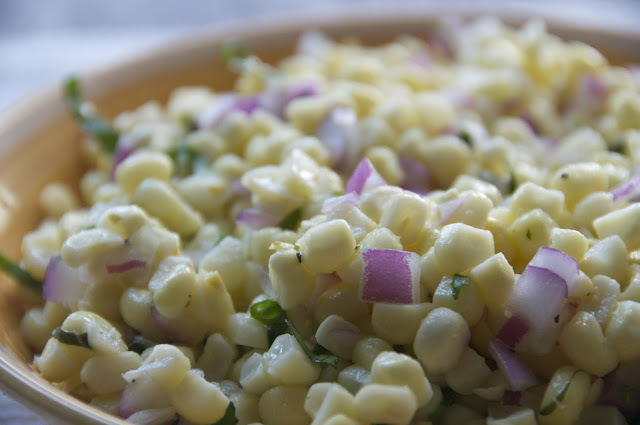 and summer is all about what we can make with this major bounty of corn. i'm making corn salad. why? because this is what i make in the summer. 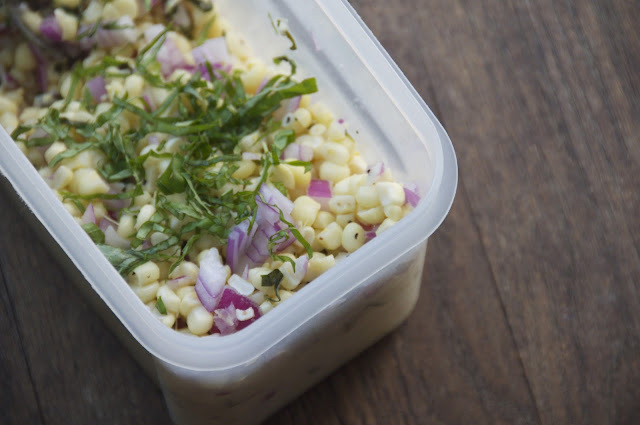 this corn salad has been in my life for a long time. each june it returns back to me for a magical summer, like a best friend who lives far away. everyone important in my life has probably had this salad. it is requested, if not demanded, at each and every barbecue. a gorgeous union of simple ingredients..the butter yellow kernals, red onion, the brightness of basil, and tangy cider vinegar to bring everything together. one bite is the freshness and crunchiness of summer. and bonus! it welcomes any number of additions...want to add tomatoes? yes. fava beans? avocado! but to me, it's most perfect on it's own. so hello sweet little nuggets, hello corn salad. welcome back, i've missed you dearly. in a large saute pan, heat a bit of olive oil and add corn. add a tablespoon or two of water and cook, stirring often until the starchiness has cooked out of the corn. it should still be very crunchy, sweet and fresh tasting. remove from heat and set aside to cool. 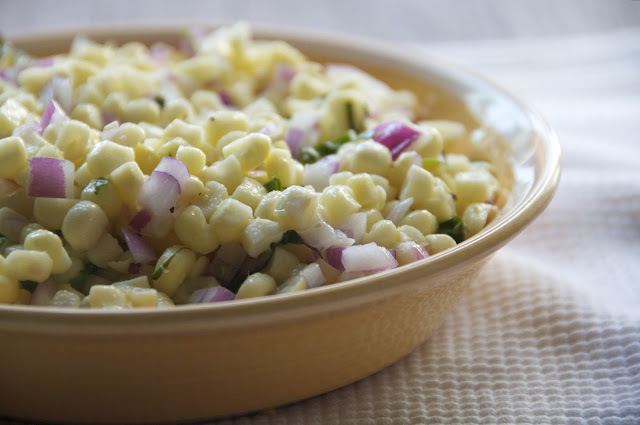 once cool, toss the kernels with the red onion, vinegar, olive oil, salt, and pepper. toss in the fresh basil just before serving. taste and adjust seasonings to your liking and serve at room temperature. YUSSS! So pumped for corn salads and corny moments that will ensue after their consumption. 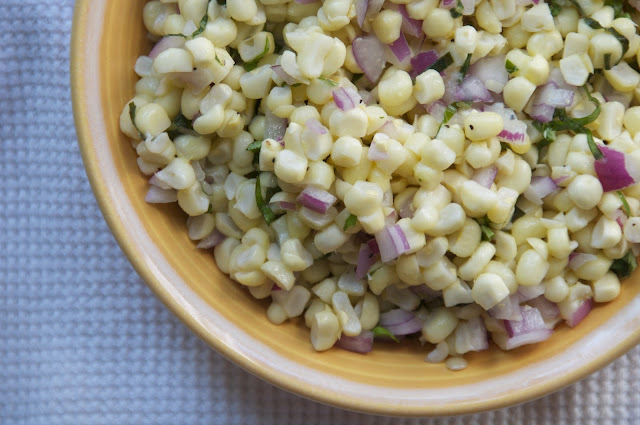 Julia: Should you cut the kernels before cooking the corn? And how can you tell when the starchiness is cooked out of the corn? yes, i like to cut them off before cooking. and just throw it in a pan and start cooking it up, it shouldn't take long, and just keep trying a couple kernels and take it off the heat when they taste good to you, with a good crunch and sweet! Thank you! 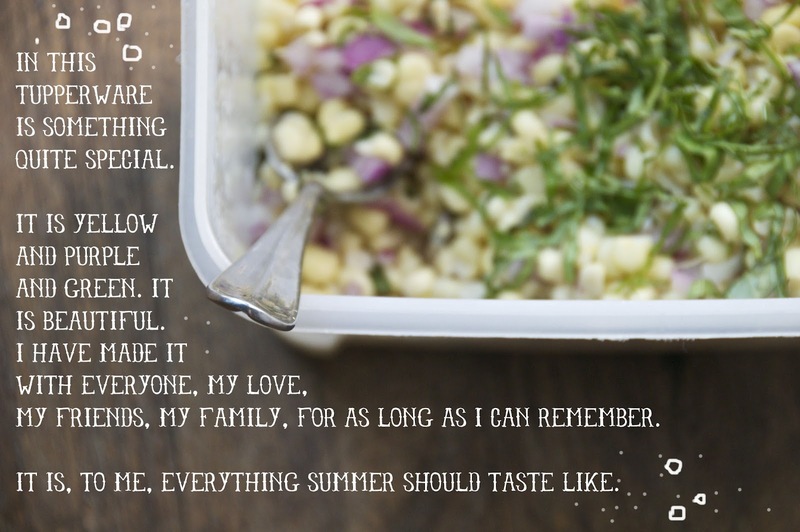 I bought ten ears of New Jersey corn yesterday at the Seashore, drooling over the thought of making this salad. Got a huge bunch of basil at Fairway this morning. Can't wait!